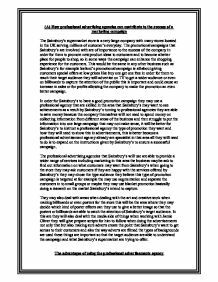 (A) How professional advertising agencies can contribute to the success of a marketing campaign The Sainsbury's supermarket store is a very large company with many stores located in the UK serving millions of customer's everyday. The promotional campaigns that Sainsbury's are involved with are of importance to the success of the company in order for them to promote new product ideas to customers and to become a better place for people to shop, so in some ways the campaign can enhance the shopping experience for the customers. This would be the same in any other business such as Sainsbury's for example Iceland's promotional campaign is all about giving customers special offers at low prices like buy one get one free in order for them to reach their target audience they will advertise on TV to get a wider audience or even on billboards to capture the attention of the public this is important and could cause an increase in sales or for profits allowing the company to make the promotion an even better campaign. In order for Sainsbury's to have a good promotion campaign they may use a professional agency that are skilled in the area that Sainsbury's may want to see achievements ...read more. 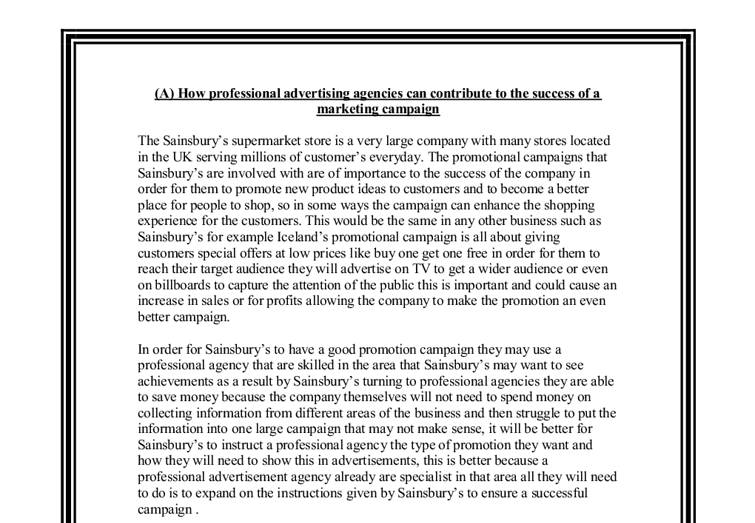 will have an influence on the customer for example if they where to target a certain area because a certain product is needed for that area then they may need to advertise in the local newspaper this is excellent because you have reached the exact or direct target you intend to target, which means that it is likely that they will respond to that advertisement because they know that Sainsbury's is local. There for the more people they are able to capture through that media method the more increase in sales in that particular area will be if they advertised in the wrong area or through the wrong media method by doing this the response will be very low and the business will definite have lost money and in some case the interest of customers next time they may advertise their target audience may not be interested this show the importance of the correct selection method. The selection of media in Sainsbury's for their latest product was through the TV this was done to capture the wider range of the target audience and adverts where sometimes done at seasonal times by doing this it contributes to the promotional campaign in the way that many ...read more. The cost is important because other money from Sainsbury's needs to be used to reinvest and to make new product that they can inject into the promotion. An additional disadvantage to Sainsbury's could be what if the promotional campaign doesn't go to plan and was ineffective if this was to happen to Sainsbury's they will be in serious consequences, they will lose a lot of money not just from using the agencies but from customers who will shop their or sales will drop and no profits will be made this can happen by not targeting the product to the correct people or targeting a segmented group all the time by doing this customers will feel as if they are not wanted anymore. Another disadvantage cold be the inconvenience of companies always having to meet to discus the promotion this can be time consuming for the both and if they do not plan the project out properly then they will waist time and the product being promoted will be kept behind for longer before they are able to issue it out to the target audience. ...read more. The other weakness is that if new changes were undertaken with the drink e.g. the ingredients changed then customers may reject it. Opportunities Opportunities are where firms can use their strengths to improve their position in the market. There are many opportunities open to Coca-Cola to improve its position. Coffee, tea and chocolate powders can be used to copromote the milk because with these kinds of product the consumer use always milk, so it can be a good strategy to do co branding with these products. We can imagine other products like cakes because to make cakes, the consumer needs milk. Designing the advertisements The creative department develops a promotional idea through effective copywriting (writing words used in an advertisement), distinctive typography (layout and styles of writing) and effective graphic designs e.g. the "Nike tick" . Producing the advertisements The production team task is to design imaginative props, generate computer animation and backdrops. Radio and television stations and networks similarly analyze their audiences for the guidance of advertisers. In this field, too, broadcast companies, advertising agencies, and advertisers subscribe to one or more audience-research organizations to determine how many viewers or listeners tune in regional and network shows at any given time. the report well and make appropriate use of images, graphs and charts to convey meaning in an accessible and comprehensive format To conclude, for Assessment Objective 5, I will make a written or verbal report to a client on the product and the marketing plan covering potential changes to the product and changes to the marketing plan. What they think of my design? Yes, it is fine 6 No, it is awful... 9 Suggestion to make it more attractive: Black is not a good colour for background. From my research I have discovered that the majority of the public I asked didn't like my design, and the rest thought that it was suitable for its purpose. However, measuring interactive communication is a lot more involved and detailed. Interactive technology will generate a virtually endless stream of consumer information. Instantly a marketer will know what individuals are interested in his product. Within seconds of any inquiry, the advertiser can respond to each and every consumer's unique set of questions and needs. * Before September 11, 2001, the US was starting the economy recover slightly and it is only just recently that they achieved the economic levels. Consumers are now resuming their normal expending habits. However, many are still handling their money cautiously.